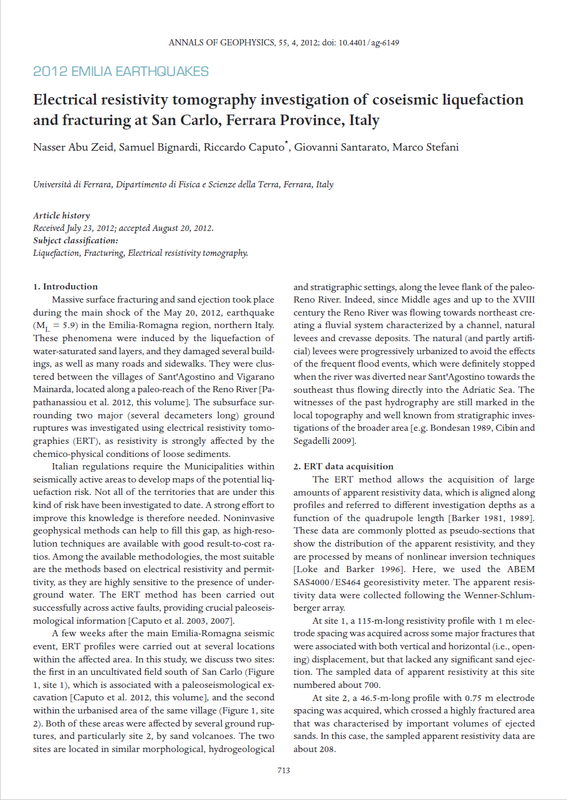 Massive surface fracturing and sand ejection took place during the main shock of the May 20, 2012, earthquake (Ml = 5.9) in the Emilia-Romagna region, northern Italy. These phenomena were induced by the liquefaction of water-saturated sand layers, and they damaged several buildings, as well as many roads and sidewalks. They were clustered between the villages of Sant'Agostino and Vigarano Mainarda, located along a paleo-reach of the Reno River [Papathanassiou et al. 2012, this volume]. The subsurface surrounding two major (several decameters long) ground ruptures was investigated using electrical resistivity tomographies (ERT), as resistivity is strongly affected by the chemico-physical conditions of loose sediments. Italian regulations require the Municipalities within seismically active areas to develop maps of the potential liquefaction risk. Not all of the territories that are under this kind of risk have been investigated to date. A strong effort to improve this knowledge is therefore needed. Noninvasive geophysical methods can help to fill this gap, as high-resolution techniques are available with good result-to-cost ratios. Among the available methodologies, the most suitable are the methods based on electrical resistivity and permittivity, as they are highly sensitive to the presence of underground water. The ERT method has been carried out successfully across active faults, providing crucial paleoseismological information [Caputo et al. 2003, 2007].